One can never have too many examples of love in a life! These are interesting times. If we took even a small percentage of what we read about or see in the news media to heart we would think that life is hardly worth living for. So stuff the bad news out of sight! Now read this that was recently published on the Care2 website. Over 80 percent of the students who attend Los Amigos Elementary School in Rancho Cucamonga, Calif., are from socioeconomically disadvantaged families, but that didn’t stop them from doing everything they could to raise money to save an animal in need. 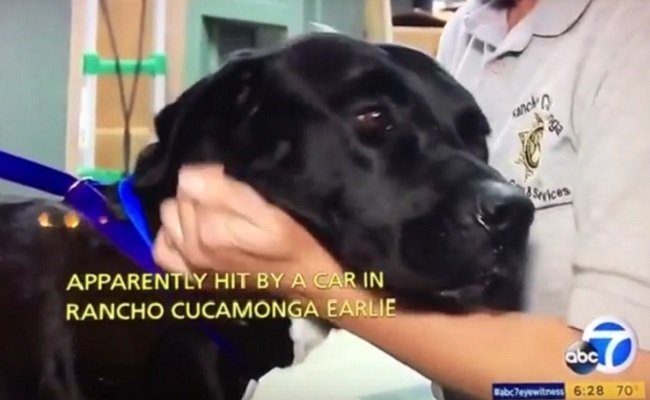 It began in early December, when a school employee found an injured black Lab mix hiding in bushes near the parking lot. “There’s this really hurt dog,” Vice Principal Sharon Linville heard over a walkie-talkie, according to the Inland Valley Daily Bulletin. “I’m sure this dog is going to die, he’s in so much pain.” She and other employees brought the dog blankets and water, and contacted the Rancho Cucamonga Animal Care and Adoption Center. The center’s staff veterinarian, Cynthia Servantez, visited the school a few days later to give the students a not-so-good update on the dog they’d named “Black Bart.” He’d been hit by a car and would probably survive, but he needed surgery that would cost about $3,000. The schoolchildren immediately took action to help put those pieces back together. The school launched a “Pennies for Paws” campaign to collect spare change for Bart’s surgery. One week later, the school gave the animal care center a check in the amount of $471.37. Servantez told the Daily Bulletin it was the first time ever that anyone had offered to pay for the medical care of an injured stray dog. The Los Amigos students continued their Pennies for Paws campaign and the momentum continued to build. Yvonne and Art Alvarez, owners of Doggie Couture in Rancho Cucamonga, were so impressed by the students’ efforts that they matched the funds that had been raised. “We wanted them to know if they do something nice, it can make other people do it and then it becomes something big,” Yvonne Alvarez told the Daily Bulletin. Several weeks after he’d been discovered at the school, “Who Let the Dogs Out” played over the speakers as Bart returned for a special guest appearance at a Jan. 23 rally in his honor. Linville announced that the Los Amigos students had surpassed their $3,000 goal – by over $4,200. The extra money would be donated to the animal shelter to help other pets in need. Veterinarian Victoria Impett, who accompanied Bart, told the schoolchildren to give themselves a pat on the back. Most of them complied. “It might not have seemed like big deal to go home and dig in the couch for a few pennies, but each and every one of you made a huge difference in someone’s life,” she told them. Bart had no ID tag or microchip, and no one has come forward to claim him. He still needs surgery on his right hip. Once he recovers, he’ll be ready for adoption. “He’s starting to kind of blossom into a fabulous dog,” Impett said. I easily found this short video on YouTube. Sue, you keep that lovely start going! So far, so good, Paul. Now if only it would snow a bit harder for Ani…she is at the window watching, but none of it is settling. And I haven’t forgotten about the article. About a third completed. This is one reason why I would consider going back out to Southern California to adopt Bart. Those school children are inspirational. Every time I see this type of story, I regain a little bit of my faith in the human race. I have no doubt that Bart will quickly find a loving home. Yes, such accounts do offer up much hope. Sorely needed in these present times. That’s so kind of them. Lord save the fur pal. Thanks Asha. Have a good weekend. The “Like” button is so inadequate here. With all the ugly and nastiness in the news, this was a very welcome story. I’ve even shared it on our FB page. Thanks, Paul. So often we need to remind ourselves of that. Realise how easily our dogs choose love ❤️. Sorry, Paul, late to pass on my thanks for that feedback from you. Wouldn’t it be great if every school and every workplace could ‘sponsor’ an animal in need, whether at a domestic shelter or at a wildlife rescue sanctuary. Even just have money boxes which people could top up. The shelter/ sanctuary could send emails giving updates about and photos of the animal. It would continually serve to remind children/people that there are other sentient beings out there with their own feelings, joys and sufferings, who need our support. That’s a brilliant suggestion. Indeed, I can’t imagine that somewhere in the world this isn’t already being done. Might raise the idea with our local Oregon director of the Humane Society of the United States (HSUS). Best wishes to you, Marg. I read about this on the animal rescue site that I click on every day to donate food. It’s just a little thing I can do other than my yearly donation to the Portland OR Humane Society. It will always be the small things people do that will make the greatest difference and these children learned so much by doing this for the dog. Empathy and entrepreneurship.